The team at Zippy Shell is proud to announce that the Greater Columbus location now offers onsite storage! That means that customers throughout the Columbus area will now have even greater access to their treasured belongings, all at an affordable price and through a company that they can trust. In order to obtain the greatest benefit from Zippy Shell storage, you must carefully consider your reason for choosing modular storage, and how you plan to access the contents of your container. For example, a family that is moving from one home to another will want to pack their Zippy Shell as efficiently as possible. It may not matter which items are placed in the front or the rear of the shell, as long as every bit of space is put to good use, and the contents are stacked in a way that prevents damage during transport. A customer who is using their shell to store excess inventory from a home-based business, however, will have a unique set of priorities when it comes to packing their unit. In this case, it may be more important to arrange more commonly used items near the front of the shell, reserving the rear for items that will not be immediately needed. Thoughtful packing can make your Zippy Shell experience far more enjoyable and useful. When packing your shell, it is important to use the right packing supplies to protect and preserve your belongings. Choose moving grade boxes for the best level of protection. These boxes are constructed to withstand a great deal of motion, stacking and shifting during transport. Cheaper boxes or those that are made entirely of recycled material may not be strong enough to keep things stable and secure during a move. It is also important to label each box so that items can be accessed as needed without having to open multiple boxes in search of your items. What Can Be Stored In A Zippy Shell? The answer depends on the size and quantity of your items, but there are some general guidelines that you can follow to select the best size shell for your needs. In general, a 10-foot shell can hold one or two rooms worth of furniture and boxed items. A 15-foot shell can accommodate two or three rooms worth of items. If you have oversized furniture or an excessive number of boxes, you may need to select a larger container or two smaller shells. 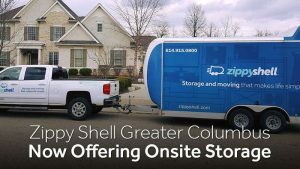 At Zippy Shell Greater Columbus, we are excited to offer onsite shell storage to our valued customers. The convenience of choosing portable moving and storage containers is why we have so many return customers, and why so many people recommend us to friends and family. We invite you to contact us for more information and to discuss your storage and moving needs.